Craffert, Pieter. The Life of a Galilean Shaman: Jesus of Nazareth in Anthropological-Historical Perspective. Minneapolis, MN: Cascade, 2007. Pp. 451. 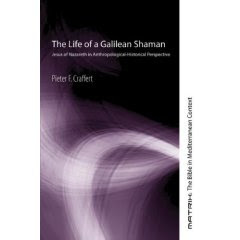 A recent addition to the "Matrix: The Bible in Mediterranean Context series", Pieter Craffert’s The Life of a Galilean Shaman, is quite a thought provoking read. While the main title is indicative of the work’s content, it may well be the case that the subtitle is even more explanatory: Jesus of Nazareth in Anthropological-Historical Perspective. Craffert uses the label “Anthropological-Historical” in contrast to the typical historical positivism that undergirds most commentaries and biblical studies. Craffert sums up his approach: “Against the notion that historians can recreate the past, anthropological historiography admits against a naïve realism that there is no one-to-one referentiality (or representation of reality)” (14). To put it more bluntly, Craffert believes that re-creating the past is never objective (e.g. the “history of ideas” approach). For him, then, when it comes to Jesus, one must consider the social and cultural processes that shaped Him. Certainly, there is merit to his claim; this is one of the strengths of His book. Another item that readers will find valuable is his discussion of “Historical Jesus” research; it is succinct and well researched. Just as well, Craffert’s explanations of how different societies think about, preserve and pass on cultural elements, practices and views of the world and reality is profound. After reading this work, one cannot walk away without recognizing the need for being more aware of our own cultural biases when reading the Scriptures. By the same token, readers must also be more aware of the cultural biases of inhabitants of the first century Mediterranean world. An invaluable section of The Life of a Galilean Shaman is when Craffert argues (in a nutshell) that too much time has been wasted on attempting to get back to the original texts of the New Testament. For Craffert—and for the most part, I find myself in agreement with his conjectures—it doesn’t matter what the original text was. Interpretation was fluid—constantly being developed and shared. I cannot reconstruct his whole argument here but I do offer one quote that gives you a glimpse into his approach: “…the canonical Gospels no longer consist of an authentic kernel covered with traditional or church overlay but are seen as different configurations of the above cultural processes about the same historical figure. They are four versions of specific cultural processes about a specific social personage that already started during Jesus’ lifetime. They are, so to speak, the literary residues of a Galilean shaman’s life” (124). In my opinion, this chapter by itself, makes the book worth owning. While there are a lot of excellent things that can be said of Craffert’s work, I have a number of critiques as well. First of all, there are a great number of typos. I was surprised to find one on the very first page with content (ix; a word is missing). Also, I felt at times as though Craffert went overboard with charts that added more confusion to what was said than anything. Another thing that I found bothersome was that all throughout the first couple of chapters Craffert uses the self-coined phrase “cultural bundubashing” without ever defining it. Finally, in the third chapter he gets around to a definition. I heard Craffert deliver a lecture last year that stuck closely to one of the chapters in the book; I was not impressed with the lecture or the chapter. Craffert seems to dig up the old “group think” argument concerning the resurrection, baptize it with new terminology and dress it in a social-science garb. He suggests that Jesus’ followers did not really believe Jesus was raised from the dead but that in a moment of ecstasy—which was common in that culture he says and not necessarily ours—everyone shared a vision of Jesus. I think Craffert has gone too far here, not just because the content is the resurrection of Jesus but because the contention is greatly flawed. Craffert’s theological reticence towards miracles leads him astray, or so it seems. I would argue that if as many people as Craffert claims all had the same exact vision, that might be a greater miracle than the resurrection itself. And this leads me to my last point about Craffert’s biopsychosocial approach. While it is a great social-science model in many respects, it seems to have some rather large loopholes. By “biopsychosocial” Craffert basically means that how a person defines sickness and healing, is culturally conditioned. So, a first century person would define an illness common to them entirely differently than someone would in the West today. In the same way, then, both parties will define the healing process and total healing differently as well. Craffert’s intent is to focus more on socio-cultural aspects of Jesus’ life than factual-historical ones. The problem is, in the end, he totally dispenses with (f)actual history and therefore, he gets to define Jesus, Jesus’ society and Jesus’ reality. While those in the West today definitely need to strive to understand the ways in which Jesus’ culture was/is different from theirs, in many respects, Craffert makes it seem as though to engage Jesus, one must engage an ancient Galilean legend or dream, or better yet, that Galilean’s (social) reality and not the Galilean Himself. Contrary to certain claims, Christianity is not just about engaging Jesus’ teachings; the Gospel is about meeting God in Christ! I'd like to know if Craffert would opine the same predilections concerning Moses and the prophets. Has the whole Christian religion, with its roots in thousands of years of Judaism, been banking upon a pre-shaman era of seers who preceded Jesus? "The Lord spoke to you out of the fire. You heard the sound of words, but saw no form; there was only a voice," (Dt 4:12). Since Deuteronomy was apparently one of Jesus' favorite books, maybe we should contend that Moses was a greater seer than he. After all, Dt 4:12 sure sounds mystical, esoteric and ecstatic to me. I don't know, Chris. I would say that I disagree with Craffert's final conclusions regarding the resurrection, rather sharply. However, his book is invaluable in sooooo many ways. You should read it. I know that Craffert indeed thinks Jesus' followers "really believed" that Jesus was really raised from the dead. What Craffert questions is how 1st C mediterranean people understood reality, what constituted knowledge that could be trusted, and thus, how they experienced events in their world. As far as "engaging Jesus himself," I suspect Craffert would say that is a different matter altogether for modern Euro-American believers. Craffert does suggest that Jesus and the gospels are cultural configurations of each other. So, the encounter with Jesus of the text, is an encounter with cultural residue the Jesus that walk the sands of Palestine.